I give DreamWorks’s “Home” 3 Slushy flavors out of 5. …of course Busta Lime is my fav! It’s fun, entertaining, has a great soundtrack, and is quite informative on the dangers of unique passwords! What if one day instead of going over the rainbow, Glenda's bubble came to your home and relocated you to a new house on the other side of the globe so the munchkins could live in your neighborhood? Well for the Munchkins it would be THE BEST DAY EVER! And so it is for the Boov! DreamWorks Animation's latest release introduces you to the Boov, an alien species on the run, hiding from their arch nemesis, the Gorg! And where did they decide to move? Yup the planet all aliens wish to inhabit, the third rock from the son, Earth! If they only knew how hard it is to park and how much traffic we have, they would probably pick Jupiter! Who's in charge of this mess? It's Captain Smek, the leader of the Boov, who's truly proud of his leadership qualities that include cowering, running and pulling a skedaddle! Captain Smek, voiced by the legendary Steve Martin, armed with his staff which he calls the susher (he smacks others on the head with it saying sush) informs the Boov that they are moving to the best hiding place in the milky way! Earth. As Captain Smek further explains, "Natives are simple and backwards" and hands out one sheet pamphlets on all they need to know about humans. Yup. One sheet. Now our story doesn't center around Captain Smek, even thought that could be quite entertaining with Steve Martin's vocal skills, it centers around Oh! Oh, voiced by Jim Parson of "The Big Bang Theory" fame, is a loner Boov who no one seems to want to be friends with no matter how hard he tries. Poor Oh even throws a "Warming of House Party" and now one shows. But that can easily be fixed by sending out an Evite! Of course Oh hits the wrong button and sends his Evite to the WHOLE GALAXY…….and that includes the Gorg. So much for best hiding place in the Milky Way! Now on the run from his fellow Boov, he runs into a human child Gratuity Tucci or Tip for short. Tip, voiced by singer Rihanna, and her car named Pig are out looking for Tip's "My Mom" who was relocated with the rest of the humans. By the fortune of fate, the two join forces on a great road trip to cancel Oh's Evite before it reaches the Gorg and to find Tip's "My Mom"! Home is beautifully digitally animated film and proves that while most of the field is catching up with the Disney/Pixar's standard of quality in animation, they still have a hard time hitting that emotional heartstring as well as only the big cheese can provide. Home is also being released in 3D, which is becoming rare in the marketplace these days. While most 3D films aren't filmed in 3D and find themselves being converted after filming, making them less that visually appealing, Home, like many other digitally animated films, is a joy to watch in 3D and would be my route if I had to choose. Home also brings to the film a fantastic score, which of course when you have Rihanna and Jennifer Lopez (who voices Tip's "My Mom") it should be a given! Lopez's "Feel The Light" could easily fall into a "Best Original Song" category for award season and of course Rihanna's "Dancing in the Dark" will have your hands in the air like you just do not care! What makes "Home" fun is all the vibrant colors that DreamWorks had put into not only the film itself, but the characters…mainly the Boov. See the Boov are normally a cute lavender/purple in color but when their emotions shift, so does their appearance. Red for Anger, Green for Lying, Yellow for Frightened, Blue for Sadness….does this sound familiar to you? Could the Boov emotionally changing colors and the emotions in "Inside Out" be pretty darn close to the same colors be a total coincidence? One has to ask the question, who had this changing color by emotion idea first? Or did both camps seem to come up with it on their own at the same time. I haven't read Adam Rex's 2007 children's book The True Meaning of Smekday, which was the material that DreamWorks adapted into what we now know as "Home", but I would love to get to the bottom of this. It's a great idea, done differently in each film. It's just incredible that both films come out 3 months apart from each other! The vibrant colors truly shine through on the Blu-ray release of this film. There is no artifacting and it is a perfect recreation of what was seen on the big screen. Home's DTS-HD Master Audio 7.1 lossless soundtrack is a bit soft at times, but as long as you crank up your speakers a bit it will play well on your system. Since Home is primarily geared towards families there are quite a bit of extras for the children, including Party Tunes, Oh's Shake Your Boov Thing, some Oh shorts, deleted scenes, a drawing featurette, and Oh's Costume Party (a interactive dress-up Oh feature). These features work great for all the young children in your house, but for the animation loving adult, not so much. At the end of the day, Home is fun and entertaining! It will definitely keep the kids entertained as well as giving a few jokes to the adults here and there. Home gives quite a few morals at the end, some great ideas of where we are in the world and how we can be different than the herd! 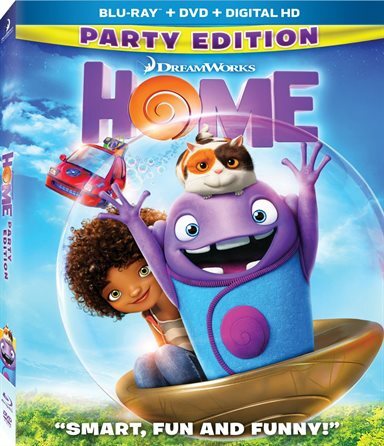 I definitely wouldn't be sad mad if DreamWorks came out with a sequel to "Home!" I give DreamWorks's "Home" 3 Slushy flavors out of 5. …of course Busta Lime is my fav! It's fun, entertaining, has a great soundtrack, and is quite informative on the dangers of unique passwords! For more information about Home visit the FlickDirect Movie Database.